If you need a barn built in Luther, OK, you’ve arrived at the right place! D Cross Barn Co. has been building post frame barns for more than 20 years, and we can construct the barn you’ve been wanting! We put your barn right where you need it! D. Cross Barn Co. can build a barn wherever you need it, even if the ground is unlevel! The barns we build are post frame structures–wood frames with posts for piers, so they can be constructed on any type of ground. Not all the buildings even require a concrete foundation. If you prefer a concrete foundation, we can pour the slabs ourselves. No need to find a second company to do that part of the job! If you’d like driveways or walkways attached to your structure, we can take care of that, too! We’ll make your barn look the way you want! D Cross Barn Co. offers a wide array of designs, colors and custom features for your barn. No need to settle for one basic look! You can choose different finishes, roofs, insulation options, doors, wall panels, windows, cupolas, and even skylights, among other features. Let us help you find the right look for your new building! D Cross Barn Co. offers warranties on our buildings and chooses high quality materials for all our construction projects. 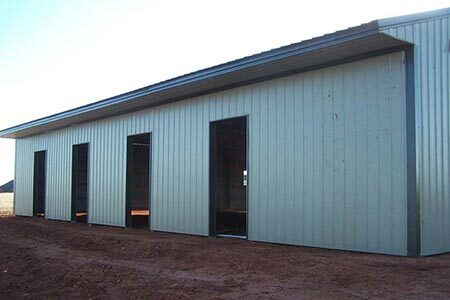 We would love to help you construct the next barn or post-frame building on your Luther, OK, property! Contact us today at at 1-866-749-7627 or 918-805-7512 for a free, no-obligation consultation, or fill out a project quote form on the Contact Us page.